Zebra Jasper - Brown and White Stripes! 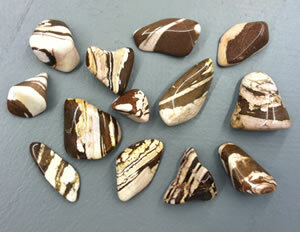 Home » Rock Tumbling Library » Zebra Jasper - Brown and White Stripes! 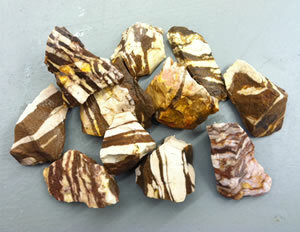 This is our zebra jasper rough, made up of some nice angular pieces with a great brown and white color-stripe pattern. Shown here is about one pound of rough, in pieces about 1 to 2 inches in diameter. This photograph was taken while the rough was wet to show its full color. 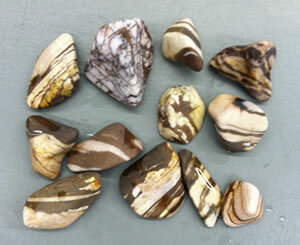 We recently tumbled some nice brown and white zebra jasper. They call it zebra jasper because of the stripes. (Yes, we know that most zebras have black stripes. However, young zebras do have brown stripes during their first year. You can confirm that here.) In the article below we will share how we tumbled this material. We had about three pounds of zebra jasper rough in pieces that ranged between one to two inches in diameter (see photo at right). Pieces of rough this large require considerable tumbling to wear down all of the points and edges to produce nicely-rounded stones. To achieve that we decided to tumble in a rotary tumbler for one month in coarse (60/90) grit. To get started we loaded our rough into a six-pound capacity Lortone tumbler barrel. With such large pieces of rough in the tumbler barrel there will be very few points of contact for grinding to occur, so we added enough large ceramic cylinders to bring our tumbler barrel up to about 3/4 full. During a tumble, ceramic cylinders occupy the spaces between the large pieces of rough. In that location they will deliver grit to and grind against the surfaces of the rough. They also act as roller bearings to produce a good tumbling action. In a six-pound barrel the typical grit charge is about 8 ounces if you are going to tumble for a week to ten days. Because we were going to tumble a month we increased that to about 12 ounces. Grit wears out over time and the extra four ounces of grit will keep grinding our jasper for the extra weeks in the barrel. This is our zebra jasper after tumbling four weeks in coarse grit and ceramic cylinders. The pieces rounded nicely! At the end of one month we opened the barrel to find nicely rounded zebra jasper pebbles. The photo at right shows a few pieces of our jasper after one month in the barrel. We use a rotary tumbler for the coarse grit step to produce nicely rounded rocks. But for speed and grit/polish savings we tumble all other steps in a vibratory tumbler. Our favorite is the Single Lot-O-Tumbler. For the medium and fine grit steps, we loaded the rocks and plastic pellets into the barrel of a Single Lot-O-Tumbler. (A six-pound Lortone barrel processes a perfect amount of rough to fit in the barrel of a Lot-O-Tumbler.) We use two tablespoons of grit for each of the medium and fine grit steps and run the tumbler for just 48 hours. Learn how we use the Lot-O-Tumbler here. 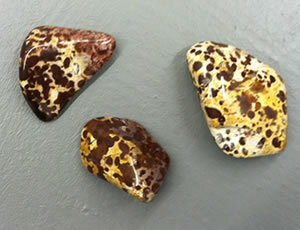 Here's our polished zebra jasper tumbled stones! Nice rounding, great color, bright polish and worth the wait! Some of the jasper that we received in this batch was spotted instead of striped. Maybe we should call it "Leopard Jasper"? If you tumble the medium, fine and polishing steps in a rotary tumbler you will use about eight ounces of grit and spend seven days per step. A vibratory tumbler will require just two ounces of grit and two days of tumbling per step - a savings of about 18 ounces of grit and 15 days! We polished the zebra jasper for a little over 24 hours using TXP aluminum oxide polish in a Single Lot-O-Tumbler. The results were great. You can see the polished stones in the image at right. Total tumbling time was one month in coarse grit and then five days in a Lot-O-Tumbler to complete medium grit, fine grit and polish. We are really happy with the results!